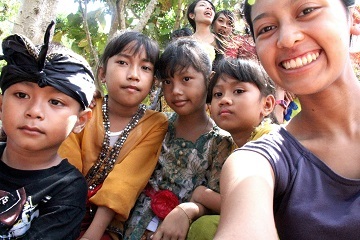 FNPF volunteer Nanistya Respati spends time with some of the local children on Bali’s Nusa Penida island . Out of all my Creativity, Action and Service (CAS) activities – as part of my International Baccalaureate studies – I can say this has been the most interesting so far. There are so many things I have in my head from this experience and I don’t quite know how to express it in an essay so I will go on with a list of factors that I think should be highlighted and elaborate on them to explain how I feel about this trip. 1. The People: I don’t know what it is about FNPF, but each and every one of the people that were involved had genuine warmth in them. I felt welcomed from the beginning and grew very comfortable in the end. It was too bad that I had limited time. I met wonderful people with different worlds and beliefs. They told me that travelling will bring you to meet interesting people, and in the end, you’ll never know if you will meet them again in the future. This is one aspect that appealed to me the most as it opened my mind to the existence of a better community with the presence of good people. They did good deeds without asking for anything in return and I admire them for this reason. 2. The Animals: There isn’t any CAS activity in Binus that revolves around animals and this is exactly what I was looking for. Even though Indonesia is known for having a wide variety of animals, not much attention has been given to preserve them which leads to unfair trades and bad treatments. Most of the time, the people who trade don’t consider the animal’s rights. FNPF has done its part and Binus students should follow. 3. Simplicity: Despite the simplicity, everyone was content. I did not hear a single complaint about the living conditions. I think I was also influenced by the good nature in the environment. I was also surprised that I did not feel the need for better living. I felt complete in that state. I learnt that we don’t need much to be satisfied. People in the cities become too caught up in everything new because they feel the need to be perfect. But in FNPF, there is no such thing as perfect. What exists is sense of self and individuality. I think that this is a lesson worth spreading in Binus. The students become so used to living an indoor life that they lose respect for nature and simplicity. 4. Love: I believe that love is what drove everyone to do good here. One of the most surprising thing that I noticed was the want to do good. FNPF did not give out any schedule or tasks, the people simply give the freedom for volunteers to help out or to relax. And surprisingly, most of them help out! In the end, I didn’t feel like I was forced to do anything because of CAS. Helping felt natural and this is what it should be all about: helping for a change and not for the hours. This is definitely an activity that I will share to future CAS students and I promise that. “The world will be a much better place if people thought positively,” –Mike (FNPF volunteer). I did a few trials to observe Ayu. The first one did not involve any specific method. I didn’t notice anything because I didn’t have specific focus. After seeing an example of the previous observation, I got a better idea of what I was supposed to do. I then had specific situations for Ayu and would observe her for 10 minutes per situation. The first observation had Ayu in the enclosure with hidden leftover food. She was searching for food the whole time and since there was just leftover food, she nibbled off the skins of the fruits. She did so for the whole ten minutes. The second trial had Ayu with no food. In that environment, she tried different leaves and ended up collecting and munching off brown leaves. She spent the whole time in one corner (further right end) and concentrated on the leaves there. The third and final condition had Ayu in her enclosure with snacks. The keeper gave me some snacks to feed Ayu. Every time I put a snack in the enclosure, Ayu made a sound from her mouth. She would then grab the snack and sit on either one of the branches on the left section of the cage. This was the only time she stayed still. All in all, Ayu spent most ten minutes going around and looking for food. Ayu spent a couple of minutes attending fur on right hand out of the one-hour observation. She didn’t scratch body parts as much as I expected it to occur, but rather searched enclosure for things to eat. She was relatively calm despite the fact that I was observing her and didn’t show signs of aggression or intimidation.